Already this fall, several retailers have pulled Halloween decorations and costumes from their shelves and online stores because they were too dangerous, too creepy, or could be used to further a rash of suspicious incidents involving people dressed as clowns. 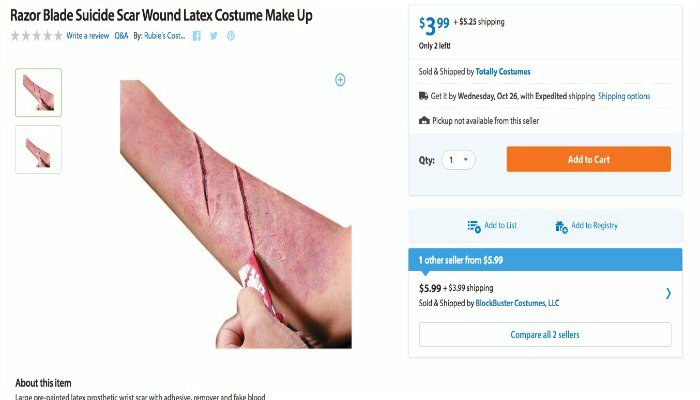 Now, Walmart is joining those ranks: the retailer is removing what it calls an inappropriate “suicide scar” costume makeup kit. WABC in New York reports that Walmart pulled the “Razor Blade Suicide Scar Wound Latex Costume Makeup” kit from its website after it drew the ire of health advocates and customers who called the costume insensitive to mental illness and glorifying self-harm. The retailer says that the product, which was sold for $3.99 online, was offered by a third-party company and was not actually from the retailer. “This costume is appalling and it was unacceptable for a third-party seller to list it on our marketplace. It clearly violated our prohibited items policy and we removed it when it was brought to our attention,” the company said in a statement. Before Walmart pulled the kit, customers shared their outrage over the inappropriate costume on social media and through a petition on Change.org. “Strong enough words do not exist to describe how horribly wrong this is,” one person posted on the petition, which has since been taken down. “I am a psychiatric nurse practitioner and know how damaging exposure to this could be. This shows an absolute lack of sensitivity and empathy for people affected by mental illness. I am absolutely appalled,” another petition signer said.